_MAL1009, originally uploaded by Michael A. Lowry. Today was lovely. The sun came out in the morning, and we got a great day of skiing in. I found a slope that's a bit off the beaten path, and it offered more of a challenge, and better snow, than the area served by the lift. You gotta walk up over the ridge after you get off the lift, and that takes ten minutes or so. But it's worth it. I did this slope twice today. here's a photo I took on my last run of the day, with a snowmelt lake in the background. In the evening after dinner, I took a quick dip in Strynsvatn, the lake beside the cabin where we're staying. It was probably the coldest and quickest swim I've ever taken in my life. Geez, that water's cold. Take a look at the new Stryn photoset I created on flickr to see more photos from recent days, including my hike up to the nearby waterfalls yesterday and my quick swim today. Tomorrow will be our last day here in Stryn. We'll pack up the cars with all our bags early in the morning after breakfast, and then drive up to the ski area. If the weather looks good, we'll ski part of the day. If not, we'll start driving back to Stockholm already in the morning. In any event, we'll be back in Stockholm soon. It has been a relaxing, exciting, and very enjoyable trip. _MAL0727_6_5_tonemapped, originally uploaded by Michael A. Lowry. The weather was rainy today, so we drove to Loen and spent a few hours at the Alexandra bath house there. It was lovely, with three different saunas. There were also a few showers with that had programmed combinations of different types of water spray, different scents, and even variations of illumination. More of an experience than a shower, but pretty fun. My favorite was a shower that combined heavy drops, a warm mist, and a eucalyptus fragrance. I gotta get one of those at home! The bath had a water slide, a big indoor pool, an outdoor pool, and several hot tubs. I spent most of my time alternating between the saunas and the hot tubs, and relaxing on a lounge with a view of the fjord. Here are a few other photos from today. 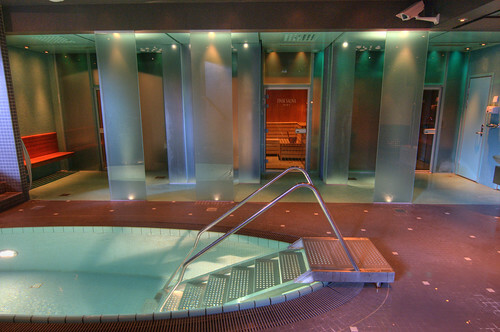 The photo above is a picture of the sauna & shower area, with the cold pool in the foreground. This mage was created by combining three exposures of slightly different shutter speeds. We're hoping for sunshine tomorrow so we can go skiing on the glacier again. Good night from Stryn! Wispy clouds cling to the verdant mountains, and a cool mist of rain blankets the valley. The lake is calm; no wind blows. The veil of clouds doesn't seem likely to lift any time soon, so the gang will probably skip skiing today. We might take drive in the mountains. _MAL0656, originally uploaded by Michael A. Lowry. Yesterday evening the owners of the Strynsvatn camping site where we're staying built a bonfire on the old pier that juts out into the lake. I walked down to the pier, watched the fire, and struck up a conversation with Magne-Hild, whom I believe is one of the owners. She has lived in this part of Norway all her life. She was born in the little village of Flo, located on the hillside just across the lake and a bit to the Northeast from here. In the days of her youth, the road tunnel through the steep mountain ridges abutting the lake's Eastern edge had not yet been dug, so her village was accessible only by boat. She told me that it was exciting and scary around the time of year when the ice on the lake was too thick for boats, but not thick enough for foot traffic. If someone fell ill and needed a doctor, it required a perilous and uncertain journey. I thought this sounded like the basis for a wonderful story! 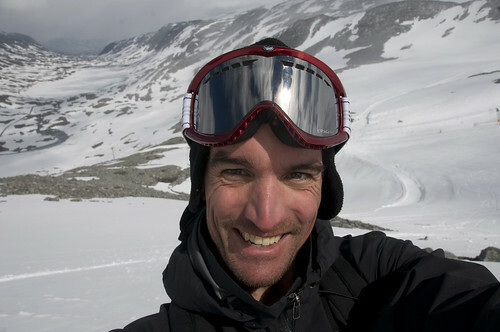 Today I did my first summer skiing, on a glacier in the mountains East of here. It was sunny and warm in the morning, and aside from the slushy snow, the skiing was quite okay. The clouds moved in this afternoon, and it's been cool and rainy since then. I managed to get a few good photos while the sun was shining, as well as a lot more in the haze and fog. Here are some photos from today and yesterday. Tomorrow I think I'll take a break from skiing and go hiking in the mountains South of the here. There's a pass there that's supposed to be about an hour's hike from the water's edge. I'll pack a lunch and head out just after breakfast. With any luck the weather will be nice and I'll get some good photos of the lake from up there. It's after midnight here (or almost midnight if you go by standard time), and yet the sky outside is not dark. The clouds hanging over the mountaintops are still glowing with the light of dusk-dawn (one and the same at this latitude and at this time of year). There is no night here in the summertime, only a darker twilight. In twenty minutes, it will be at its darkest and will begin to get lighter again. It's time for me to get some sleep. I'll brush my teeth, crawl up into the top bunk of the bunk bed where I'm sleeping, and nod off for a few hours. Over and out. Yesterday afternoon, Åsa and Patrik picked me up and we drove to Norway. We stayed the night in a friend's cabin in Trysil, and then continued our drive Westward this morning. 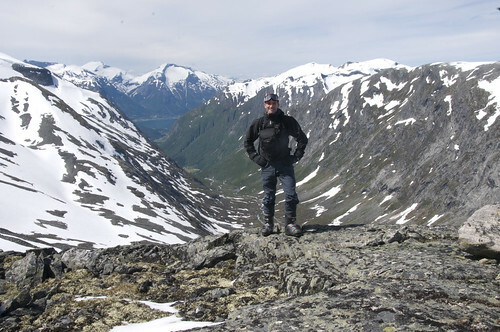 We crossed over the pass, through a few tunnels, and down into Stryn, where we'll spend the next week. We're staying down in the valley in a cabin by the fjord. In the morning, we'll drive twenty minutes back up to the pass, where we'll ski on the glacier atop the mountain ridge. It should be great! We just sat down to a lovely midsummer's eve dinner of pickled herring, gravad lax, boiled new potatoes, and broccoli and ham quiche. We washed it down with beer, and of course, Norwegian aqvavit. Damn, alcohol is expensive here. One half-liter can of beer in the grocery store costs about 4 USD. If the skiing is too slushy on the glacier, there are other options down valley. We can go kayaking on the river or climbing on any of the many cliffs. The latter depends on somewhat dry weather though, and right now it's still raining. Typical midsummer weather! More to come soon, including photos. Love from Norway. I had dinner at the Zeughauskeller restaurant tonight, and had a delicious dish of veal in mushroom sauce with fried potato hash. I'm surprised I was even able to find a place that was open. This city seems to close down completely on Sundays. Tonight is not boring for footbal (soccer) fans though: throughout the city, outdoor TVs are set up to play the Euro Cup matches for the public. Tonight's match is between the Czech Republic and Turkey. I've posted a few photos from today. More later. Thanks to Sam for pointing out that the tournament being held in Switzerland is the Euro Cup, not the World Cup. As you can probably see, I'm not much of a sports fanatic. I'm in Zürich for a job interview tomorrow at the IBM Zurich Research Laboratory (ZRL). I passed through the airport here on my way to Andermatt a few months ago, but this is my first visit to the city proper. I'm going out now for some dinner and a bit of sightseeing. It was less that one year ago that I did my first lead climb, indoors at Salveo Gym. Since then, I have gotten quite good at lead climbing on indoor and outdoor bolted routes (those with bolts permanently attached to the wall or rock). Last year, I bought a bunch of traditional climbing equipment while in the U.S. on trips to Texas and Massachusetts. My climbing bag is now well-stocked with climbing equipment, including nuts, cams, and an assortment of other devices. However, until this past weekend, I had not actually done any actual “trad” climbing—that is, climbing wherein one secures oneself against a fall by placing protective devices in cracks in the rock. I thought I should give it a try, put my expensive gear to use, and see if I liked it. So this past weekend I did my first trad climbing. I took a two-day course arranged by Solna Klätterklubb. The instructor, Andreas Bengtsson, was knowledgeable and friendly. On Saturday we went to Vårdberget near Fituna. The other students who had originally signed up for the course had cancelled, so Andreas had told me I was welcome to bring a friend. I invited Linda and she joined us for the first day. It was a beautiful, sunny day; the temperature was well above 25° C, and probably closer to 30°. Once at the cliff, we got some basic practice building anchors and placing protection. In the afternoon, we sought refuge from the sun by retreating into the shaded crevice at the left end of the wall. After a long and sweaty day, we cooled off with a refreshing dip in the sea. On the second day, Andreas took me to Grönbrinksberget, another cliff in the Fituna area. I had never been to this cliff before, because almost all of the routes there require trad climbing. We started off by rigging an anchor from a big pine tree at the top of the cliff and rappelling down. Next, I climbed an easy 4+ route on a top-rope, but placing protection and clipping in another rope as I ascended, just as though I were leading the route. Once I had reached the top, I rappelled back down. Having familiarized myself with the route already, I felt confident enough to do my first traditional lead climb on the same route. A route with a Swedish grade of 4+ is quite an easy route for me, but it was a completely different experience leading it and placing protection along the way. It felt like a 5 or even a 6 because of the added work of placing protection. It's psychologically more demanding as well, because the protection one places is the only thing one relies upon to stop a fall in the event that one looses one’s grip! I completed the route without any problems though, and it was actually easier and less scary than I had expected. I attribute this to the work done leading up to that point, getting comfortable with the trad gear and learning how to place it properly. In addition, the route was very easy to protect, with excellent places for nuts and cams all the way up the route. I must also give Andreas credit for his patient tutelage. After my first trad lead climb, I secured Andreas as he climbed up and reviewed the pieces of protection I had placed. He pointed out potential problems but in general there were none. He told me that I had an eye for good placement of “pro.” Once he reached the top, we took a break for lunch. As a place to have lunch, it's hard to beat the sunny and windy top of 30-meter cliff overlooking the Swedish countryside. By coincidence, we ran into Matt & Lisa at the cliff. They were also there for a day of climbing, along with Johan and Maria, two other climbers from Klättercentret. They joined us at the top for a while and we all had a bite to eat. After lunch, we moved the top-rope to another route and constructed an anchor using a rope around a pine tree and a cam placed in a crack in the rock on the top of the cliff. We rappelled down one by one and then I repeated the same procedure as in the first ascent: climbing secured by the top rope, but placing protection as though I were leading. This route was quite a bit more difficult than the first one, and I reached the top only after resting on the top-rope a few times along the way. If I had been leading the route, I would have had to down-climb or fall at the points where I had run out of strength. That scary prospect convinced me that I wasn't quite ready to lead this particular route. Instead, we moved back to the first route we had climbed in the morning and I practiced falling. This was perhaps the most scary part of the day, but also the most rewarding. With me belaying him, Andreas climbed up and placed a few pieces of protection. He then fell on the top piece a couple of times to confirm that it would catch a fall. Then he came down and I climbed up to just above where his pro was, placing a large nut in the same crack. I climbed up a bit more and then, after a moment of hesitation, convinced myself to let go of the rock. I was probably a good 10 meters up the wall at this point, so letting go was not really easy. But I did it, and of course I was alright. The nut didn't budge, and I fell twice the distance from the point to which I had climbed and the nut. I actually fell a bit more than that, there being a bit of slack in the system. Next, I climbed up a bit higher and did the same thing. No problem: scary to fall, but so reassuring to experience first-hand that the protection does work. I then repeated the same procedure a bit higher up on the wall with a cam. I placed my green Camalot in a lovely crack in the rock, clipped in the rope, climbed up a bit, and then let go. The cams are a bit more complicated devices than the nuts, so until I actually took a fall on one, I wasn't really sure it would work. But I'll be darned if the thing moved a millimeter. I climbed up a bit more and took what was probably the longest fall of the day, 3-4 meters. Again, the cam held. I wasn't completely prepared for the length of that fall though, and I ended up bumping into the rock face with my hip and shoulder. I was a bit shaken, but otherwise unscathed. I have much more confidence in my equipment now that I have fallen on it a few times. The falling exercise was a good way to end the course. I look forward to doing some more traditional climbing soon. But one thing I have learned is that some traditional climbing can be risky. If there aren't any good places to put protection, it could be tempting to some climbers to satisfy themselves with a poor placement and to just continue climbing. However, I prefer to avoid this kind of risk. Yes, there is some risk involved. And yes, part of the excitement comes from imagined risk, and from overcoming the fear associated with that feeling. However, the way I climb, I do not do anything that is actually very risky. I have no intention of climbing routes that cannot be well protected. Over and out from sunny Stockholm. Oh yeah, one more thing: Lisa took a few photos of me when I was preparing to my falling exercise. I will post these photos and more soon. I have had an AT&T-Citibank Universal MasterCard for more than a decade. I applied for the card when I was in college, and have been a loyal customer since then. Today, AT&T and Citibank lose me as a customer. A few months ago, due in part to the company's greedy and inflexible policies, my account was put on hold. After several lengthy discussions with their customer service personnel, my account was reactivated and several fees were waived. I was so frustrated by the experience that I wrote about it at length. In a rare event that I at the time chalked up to good karma, I was given the opportunity to provide feedback on my experience with AT&T-Citibank's customer service. I filled out a survey form and explained what happened. I detailed what the company had done wrong and what they could do to improve their service. I emphasized that the people with whom I had spoken had done they best they could to help me, and had always been polite. I also referred to the aforementioned blog post so that they could learn more about my experience. Well, apparently someone read it because shortly after that time, AT&T-Citibank permanently closed my credit card account. They did so without so much as notifying me. I learned about it only today when I tried to use the credit card to buy some flowers for my mother's birthday. I am very disappointed by the actions and policies of AT&T-Citibank. Until such time as I receive a formal written apology, both of these companies have permanently lost me as a customer.